Two more bodies were found in trouble-torn districts of Assam, taking the toll in the mayhem unleashed by ultras there to 36, even as the curfew clamped in the area was relaxed on Tuesday as no fresh violence was reported from anywhere. Police said the body of a seven-year-old girl was fished out from Beki river near Barpeta Road on Monday night while the body of 35-year-old woman was found at Baksa. 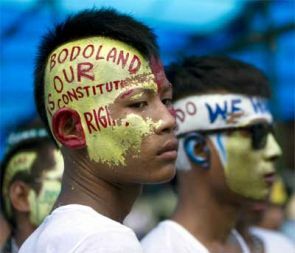 There were no bullet wounds on their bodies and it was suspected that they had died while attempting to flee during the attacks by National Democratic Front of Bodoland (S) on Thursday last, the police said. The curfew, which was imposed on Friday night, was relaxed from 10 am for eight hours at Baksa, for 6 hours at Kokrajhar and for 8 hours at Chirang district. Meanwhile, Assam Human Rights Commission issued a notice to Assam government to conduct an inquiry into alleged involvement of six forest personnel in the attacks. It initiated a suo motu case based on reports in the local media that the six forest personnel were allegedly involved in the violence that erupted in BTAD area on May 1 using departmental weapons and joined hands with certain organisations. A single bench of the commission of Tarun Phookan issued the notice to the Assam government and asked it to submit the report within 45 days. Several organisations like All Assam Muslim Students Union, BJP's Minority Cell and CPI (Marxist-Leninist) took out protest marches and held meetings condemning the attacks and demanding immediate arrest of the culprits.